How can people with little experience of learning best be taught German? Key elements are the motivation of the target group, a contrastive approach to language teaching and innovative learning settings. This places particular demands on teachers in terms of their intercultural, methodological and personal skills. Nobody can prescribe successful learning, and internalization or transfer cannot be achieved by coercion or pressure. As a rule, adults come to GSL or GFL classes of their own accord because they want to learn German, for professional or personal reasons. Some of these learners lack intrinsic motivation, however. For many refugees and immigrants, the initial impetus for attending a course may come in the form of a requirement from the immigration authority or job centre. But what happens when people learn German only in order to comply with an official requirement? But how under these circumstances can any kind of positive learning process be initiated? Learning will be more successful if a student can draw on knowledge they already have. Since people with little experience of learning are in possession of virtually no learning strategies, teaching should reflect the reality of their lives. Worthwhile and interesting teaching materials tend to have some relevance to the learner’s everyday life: a real letter will have a different motivating effect on the learner than a fictitious one in a textbook. For learners unused to writing and school, it is particularly important to involve their spoken native language. This allows them to actively contribute and suggest topics of their own, and to experience appreciation and self-efficacy as “experts” in their mother tongue. The letter b – in all four Arabic forms | Photo: © GIZ e.V. In this context the contrastive method of second language acquisition has proven successful. Based on the commonalities between German and the learner’s native language, this method allows the learner to draw on existing knowledge. 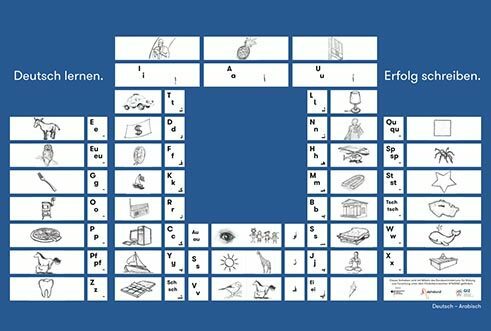 Contrastive GSL lessons of this kind make it easier for learners to understand the structures of the German language. The letter L for example exists in Arabic, Turkish and German, and is pronounced in the same way, making it easy to learn. By contrast, the German letter ß does not appear in either Arabic or Turkish, and is therefore the last letter that learners are given to tackle. Exponents of the identity hypothesis such as Susan Ervin-Tripp and Henning Wode assume that learners automatically apply the rules and elements of their mother tongue to the second language. In his theory of language acquisition, Noam Chomsky also points out that the language skills achieved in the second language are related directly to those in the first language. Similarities between the languages therefore result in a positive transfer, while differences and disparities give rise to interferences that hinder the learning process. To counter this challenge in literacy work, ABCami project members worked with Turkish and Arab learners to draw up a table of initial sounds. 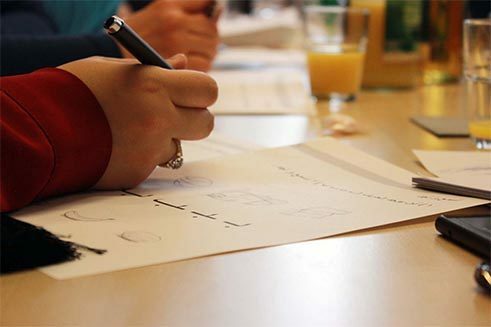 The adult learners, who as a rule had attended school only briefly or not at all – and many of whom had already attended other German courses with generally little success – confirmed that they could now finally understand the language. Contrastive German-Arabic table of initial sounds from the ABCami project | Figure: © GIZ e.V. Furthermore, the learning environment can also provide an opportunity to motivate learners. Classrooms that are reminiscent of school have a negative bearing on the learner’s attitude and stamina. People who do not regularly use writing or a pen have other interests and hobbies. Clubs, or indeed churches and mosques, can be good places in which to learn German. Learners from the ABCami courses report that they did not feel at ease in secular learning settings. By contrast, their efforts are appreciated at the Mosque and they can also take time out to pray there. At the same time, this also results in Mosque-goers embracing the secular question of literacy. For learners unused to school, teachers play a special role as mentors. Besides patience, empathy is also important. How do I feel when I turn out not to be good at something? Feelings of shame or fear can cause learners to withdraw, and should be avoided at all costs in the classroom. In addition, intercultural skills are important – a teacher who is familiar with the learner’s background and biography will be able to relate in a more individual way to the learner. Particular demands are also placed on teachers in terms of their methodological skills. It is not only a question of knowing and applying various different methods, but of putting them into an intercultural context. Group work and learning at “stations”, both of which require learners to work independently and keep track of their own progress, are methods that are not known in many school systems. Learners unused to school can easily become flustered if asked to organize the learning process themselves. In many cases, such approaches to teaching are not even seen as “school”. For example, if learners are regularly given free time to work on their own in the mornings, they may well start coming in late because in their eyes the class only begins properly after this session. Repetitive exercises on the other hand are both familiar and popular, and increase the success of learning. When working with a target group of learners who are unused to school, teachers are also learners. Time and time again they are required to observe, reflect and adapt their approach accordingly. This process may give rise to uncertainty, but it also expands and broadens the teacher’s own skills and abilities. Chomsky, Noam (1965): Aspects of the Theory of Syntax. Cambridge, MA: The M.I.T. Press. Grotlüschen, Anke/Riekmann, Wibke (Ed.) (2012): Funktionaler Analphabetismus in Deutschland. Ergebnisse der ersten leo. – Level-One Studie. Münster, New York, Munich, Berlin: Waxmann. Günther, Britta/Günther, Herbert (2004): Erstsprache und Zweitsprache. Einführung aus pädagogischer Sicht. Weinheim: Beltz. Linde, Andrea (2008): Literalität und Lernen. Eine Studie über das Lesen- und Schreiben-lernen im Erwachsenenalter. Münster, New York, Munich, Berlin: Waxmann. Marschke, Britta/Brinkmann, Heinz-Ulrich (Ed.) (2014): Handbuch Migrationsarbeit, 2nd edition, Heidelberg: Springer. Dr Britta Marschke heads ABCami – Literacy and Adult Education in the Mosque, a project funded by the Federal Ministry of Education and Research.